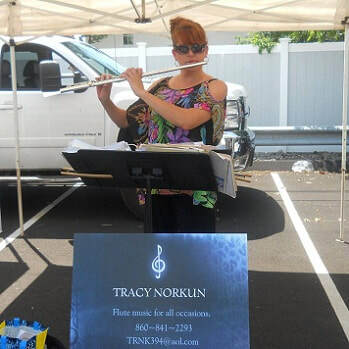 Professional flutist Tracy Norkun is excited to be joining the market this year. Tracy has over 30 years of playing experience, is principal flute of the West Hartford Symphony Orchestra and freelances throughout CT and MA. She also travels the state giving private lessons and masterclasses to flute students of all ages. Her music ranges from classical to country, jazz to pop, Bach to the Beatles, and spans the musical ages.